Here are eight areas that do have an effect on the Eye Vision. 2. Activity engagement and general health. 5. Concentration skills and objective focus. 8. Passion and interest, motivation for life. The Eye Vision system is highly sophisticated system; it has a very precise organization of the interface structure that enables the eyes to see, adjust and focus during day time and night time. 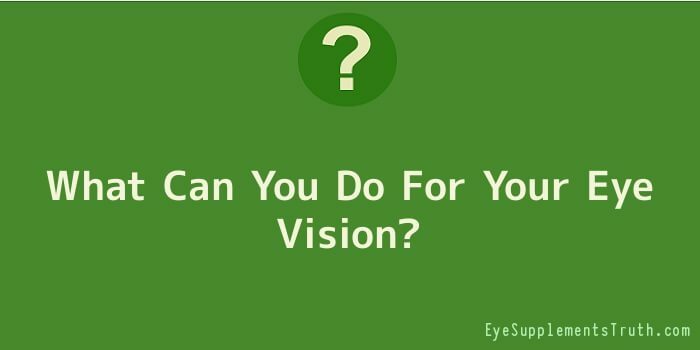 It is by the scientific proof and the nature of the constant laws of physics and biology, that we can conclude that yes it is possible to improve the Eye Vision, because it can be studied and known by a scientific method. But there are hurdles in the way for some people, and the hurdles are mostly in the will. Unmotivated people don’t believe that anything is possible, they tend to be fatalistic. It has to be the will to take control and choose actions that make it happen and the change for better in the Eye Vision can starts to take place. Changes do happen all the time; the human body is affected by: what we do with it, what we think and what we feed the body and the mind. It is not a static robot made of steel, rubber and plastic. It is an organic system. 1. The person must want to improve their eye sight, and implement changes. 2. They need to understand the basic mechanics of the eyes, rational thinking. 3. Have a natural passion for good health, a natural harmony for balance. 4. The will to stop engaging in habits that are negative to their eye health. It is not only the will of the person that can stop their health from improving, but also the ignorance of what supports a healthy body. It is necessary to take the time to understand how their actions or in-actions have an effect on the health of the many systems of the body. Most days are full of decisions about; what to think; what to do; what to buy; what to cook; where to go and who to see. Not every one’s life is equal, and there are many people at a different stage in their age span. Ideally, during the growing up years they received healthy nutritious food, and were taught the basic important principles of good health, and how the systems of the body work; what they need, how often and what are good habits and what are bad habits, there is a clear distinction between the two. Lungs need daily exercise and lots of clean fresh air. The heart needs a healthy balance of nutritious foods, not too much, not too little. The muscular systems need variety of exercise and stretching, the skeleton system sensible physic positions and healthy exercise, and also good ergonomic practices for posture.